Tonight we are going to review a wine that is a bit rare and a bit unique, as it is a single varietal viorica wine – Viorica 2016 from Bravo Wine. Viorica variety is little known outside of Moldova, as it is mainly used in production of local sparkling and table wines. It is an indigenous grape variety and it was long considered the visit card of Moldova’s wines, as it is distinguished by an expressive and intense aromatic bouquet, reminiscent of wild flowers and sweet fruits. 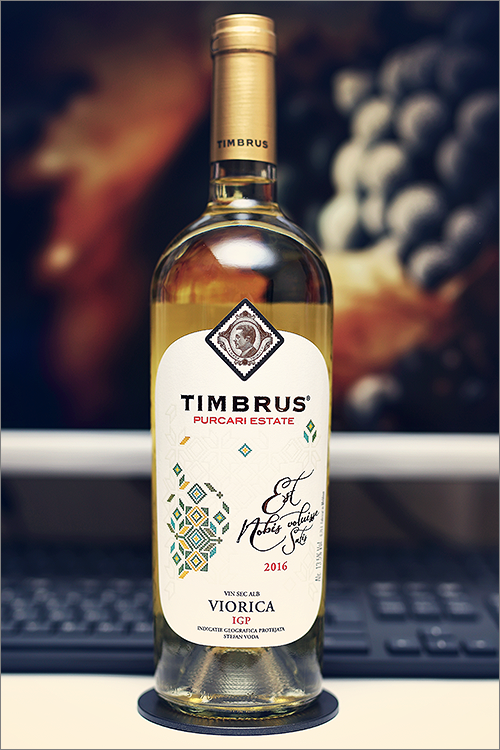 Local winemakers tend to produce off-dry or demi-sweet viorica wines due to its nuanced aromatics, this is why this wine is a rare find, as it is a dry one. But enough with the theory, let’s find out just how good this wine is. Topaz yellow color with bright pastel yellow hues towards the rim of the glass. The nose is strong, filled mostly with floral and sweet fruits flavours: acacia flower, rose petals, linder flower, daffodil, pineapple, yellow mirabelle, white iris flower, yellow apple, apricot, sweet lemon and some nuanced hints of candied apricot. The wine is medium-dry, with moderate alcohol level, moderate acidity and ripe tannin. It tastes smooth, lean and quite opulent with a nuanced oily-floral accent. The wine feels floral, a bit rough and a bit angular, crisp, zesty and very aromatic, with a fair overall balance. It has a medium finish and a balanced, oily-crisp aftertaste. Conclusion: this is a wine in its prime form or nearabout, definitely ready to drink now and not worth of any kind of ageing, as it feels a bit angular and sharp at first, yet lean and opulent overall. It may seem to be very aromatic on the nose, still, on the palate, it feels quite well balanced. In order to smoothen the sharp edges and amplify its aromatics, we would recommend to pair this wine with asian spicy-sweet cuisine, like for example sushi/sashimi or some thai rice noodles with basil and lime. Cheers!